For other uses, see New Sweden (disambiguation). 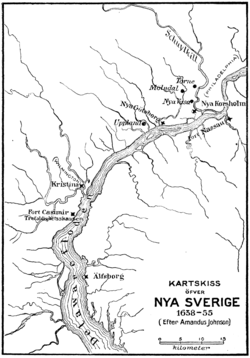 New Sweden (Swedish: Nya Sverige; Finnish: Uusi Ruotsi; Latin: Nova Svecia) was a Swedish colony along the lower reaches of the Delaware River in America from 1638 to 1655,  established during the Thirty Years' War when Sweden was a great military power. New Sweden was part of Swedish colonization efforts in the Americas. Settlements were established on both sides of the Delaware Valley in the region of Delaware, New Jersey, and Pennsylvania, often in places where Swedish traders had been visiting since about 1610. Fort Christina in Wilmington, Delaware was the first settlement, named after the reigning Swedish monarch. The settlers were Swedes, Finns, and a number of Dutch. New Sweden was conquered by the Dutch Republic in 1655 during the Second Northern War and incorporated into the Dutch colony of New Netherland. By the middle of the 17th century, the Realm of Sweden had reached its greatest territorial extent and was one of the great powers of Europe. Sweden then included Finland and Estonia, along with parts of modern Russia, Poland, Germany, and Latvia under King Gustavus Adolphus and later Christina, Queen of Sweden. The Swedes sought to expand their influence by creating an agricultural (tobacco) and fur-trading colony to circumvent French and English merchants. The Swedish South Company was founded in 1626 with a mandate to establish colonies between Florida and Newfoundland for the purposes of trade, particularly along the Delaware River. Its charter included Swedish, Dutch, and German stockholders led by directors of the New Sweden Company, including Samuel Blommaert. The company sponsored 11 expeditions in 14 separate voyages to Delaware between 1638 and 1655; two did not survive. The company expanded along the river from Fort Christina under the leadership of Johan Björnsson Printz, governor from 1643 to 1653. They established Fort Nya Elfsborg on the east bank of the Delaware near Salem, New Jersey and Fort Nya Gothenborg on Tinicum Island to the immediate southwest of Philadelphia. He also built his manor house The Printzhof at Fort Nya Gothenborg, and the Swedish colony prospered for a time. In 1644, New Sweden supported the Susquehannocks in their war against English colonists in the Province of Maryland. In May 1654, soldiers from New Sweden led by Governor Johan Risingh captured Fort Casimir and renamed it Fort Trinity (Trefaldigheten in Swedish). ^ "Delaware". World Statesmen. Retrieved January 18, 2015. ^ Copy the cite data from the New American Heritage book of Indians on Susquehannock. ^ "A Brief History of New Sweden in America". The Swedish Colonial Society. ^ Mark L. Thompson (2013). The Contest for the Delaware Valley: Allegiance, Identity, and Empire in the Seventeenth Century. Louisiana State University Press. ISBN 978-0-8071-5060-3. ^ McCormick, p. 12; Munroe, Colonial Delaware, p. 16. ^ Thorne, Kathryn; Ford, Compiler; Long, John H., eds. (1993). New York Atlas of Historical County Boundaries. The Newbury Library. p. 5. ^ "Estonians in North America, 1627–1896". www.oocities.org. ^ Shorto, Russell, The Island at the Center of the World, Part II; Chapter 6; Pages 115–117. ^ "Upland Court". West Jersey History Project. ^ "Gloria Dei (Old Swedes') Church". National Park Service. ^ a b c Documents Relative to the Colonial History of the State of New York. 12. pp. 507–508. ^ Parry, Clive, ed. Consolidated Treaty Series. ; Vol. 13, p. 136; Dobbs Ferry, New York; Oceana Publications, 1969–1981. ^ a b Documents Relative to the Colonial History of the State of New York. 12. p. 515. ^ Documents Relative to the Colonial History of the State of New York. 12. pp. 561–563. ^ Armstrong, Edward (1860). Memoirs of the Historical Society of Pennsylvania: Volume 119; Record of the Court at Upland, in Pennsylvania, 1676 to 1681. Pennsylvania: Historical Society of Pennsylvania. p. 198. ^ Documents Relative to the Colonial History of the State of New York. 12. pp. 654, 664, 666–667. ^ Armstrong, Edward (1860). Memoirs of the Historical Society of Pennsylvania: Volume 119; Record of the Court at Upland, in Pennsylvania, 1676 to 1681. Pennsylvania: Historical Society of Pennsylvania. p. 196. ^ Pennsylvania Archives, 2nd series, Vol. 5: pp. 739–744. ^ Barton, A Folk Divided, 5–7. ^ "Museum Galleries | American Swedish Historical Museum". www.americanswedish.org. Retrieved February 7, 2018. ^ Henry C. Pitz, The Brandywine Tradition, Weathervane Books, 1968. pp. 4–5. ^ Mary Trotter Kion, "New Sweden: The First Colony in Delaware". July 23, 2006; accessed 2010.03.10. ^ "Nothnagle Log Cabin, Gibbstown". Art and Archtitecture of New Jersey. Richard Stokton College of New Jersey. Archived from the original on July 19, 2011. Retrieved May 24, 2011. ^ Oldest – Log House in North America – Superlatives on. Waymarking.com. Retrieved on July 23, 2013. ^ Wedin, Maud (October 2012). "Highlights of Research in Scandinavia on Forest Finns" (PDF). American-Swedish Organization. Retrieved November 7, 2012. ^ Spiegel, Taru. "The Finns in America". European Reading Room. Library of Congress. Retrieved August 26, 2010. ^ "Finland monument at Concord Avenue in Chester, Pennsylvania". Historical Markers. ExplorePAhistory.com. Retrieved August 26, 2010. ^ "Site of Fort Casimir". Delaware Public Archives. State of Delaware. Archived from the original on August 21, 2010. Retrieved September 14, 2010. ^ a b c d e f g h i j k l m n o p q r Johnson, Amandus. The Swedish settlements on the Delaware, 1638–1664.. Swedish Colonial Society, 1911. ^ Sheridan, Janet L. (2007). ""Their houses are some Built of timber": The colonial timber frame houses of Fenwick's Colony, New Jersey". University of Michigan Ann Arbor: 182. Retrieved July 24, 2013. ^ Howe, Henry; Barber, John W. (1844), Salem, NJ, New York: S. Tuttle, In 1641, some English families, (probably emigrants from New Haven, Conn.,) embracing about 60 persons, settled on Ferken's creek (now Salem.) About this period, the Swedes bought of the Indians the whole district from Cape May to Raccoon creek; and, in order to unite these English with the Swedes, the Swedish governor, Printz, who arrived from Sweden the year after, (1642,) was to "act kindly and faithfully toward them; and as these English expected soon, by further arrivals, to increase their numbers to several hundreds, and seemed also willing to be subjects of the Swedish government, he was to receive them under allegiance, though not without endeavoring to effect their removal." ^ Williams, Rev. Dr. Kim-Eric. "Trinity Episcopal Church". The Swedish Colonial Society. Archived from the original on January 15, 2008. ^ "History: Early Settlement". Trinity Episcopal "Old Swedes" Church. Trinity Episcopal "Old Swedes" Church. Archived from the original on September 5, 2008. ^ Roncace, Kelly (May 14, 2012). "What's in a Name? Raccoon Creek". South Jersey Times. Retrieved July 22, 2013. ^ "The Kepharts: Cohawkin, Raccoon Creek, Narraticon all names left by Lenni-Lenape in Gloucester County". Barton, H. Arnold (1994). A Folk Divided: Homeland Swedes and Swedish Americans, 1840–1940. (Uppsala: Acta Universitatis Upsaliensis). Wikimedia Commons has media related to New Sweden.